- that are my most favourite! 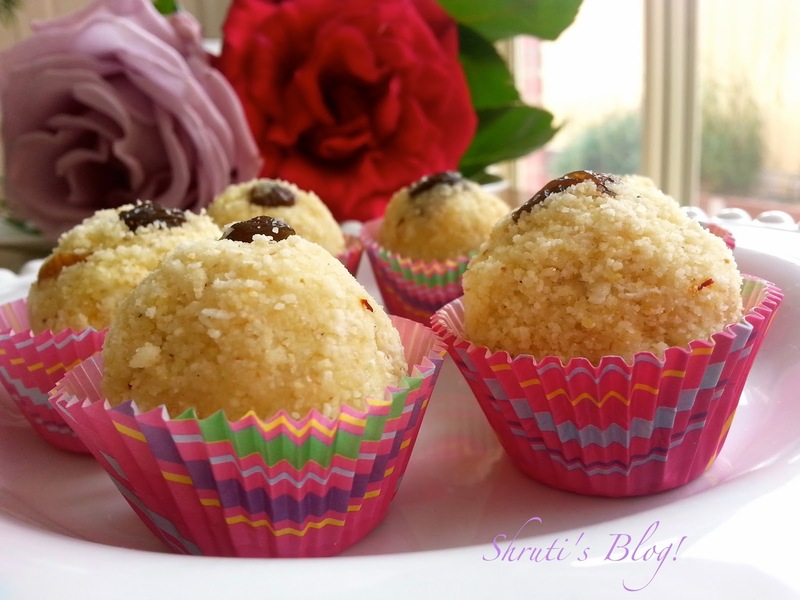 Note – you can add khoya or milk powder after adding the syrup to the roasted semolina and coconut. I haven’t, since these laadoos were meant to be vegan. Quiz – why are they called Raghavdas Laadu? Heat oil/ghee in a heavy bottomed pan and add semolina. Roast it on very low heat till it gets fragrant. Take care not to brown the rava much. Add the pinch of salt. I have learnt it from my mother to add a pinch of salt to sweets that don’t have a milk base. It enhances the sweetness and rounds off the flavours. When the semolina starts to get pushed around the pan quite freely and also seems lighter to the spatula, add the coconut. As soon as you do that, the semolina will turn slightly moist, but quickly will turn light and airy as you continue roasting on low heat for a few minutes. Don’t over roast, or the coconut will start smelling very strongly of fried coconut. Remove the pan from the heat. Set a saucepan with the sugar and about one cup of water on heat and stir till the sugar dissolves. Boil the solution into a one-string consistency syrup. Add the syrup to the semolina mixture and mix well. Add the cardamom powder, fried raisins and cashews, reserving some raisins for decorating the laadoos while rolling them. At this stage the mixture will be the consistency of a thick and sticky batter. Cover the pan with a tea cloth and set aside to cool. To get really soft and melt in the mouth and airy laadoos you will need to let the semolina mixture soak for at least a few hours, stirring every now and then to ensure the mixture doesn’t set firm. The semolina mixture will soak up syrup gradually and each grain will fluff up. 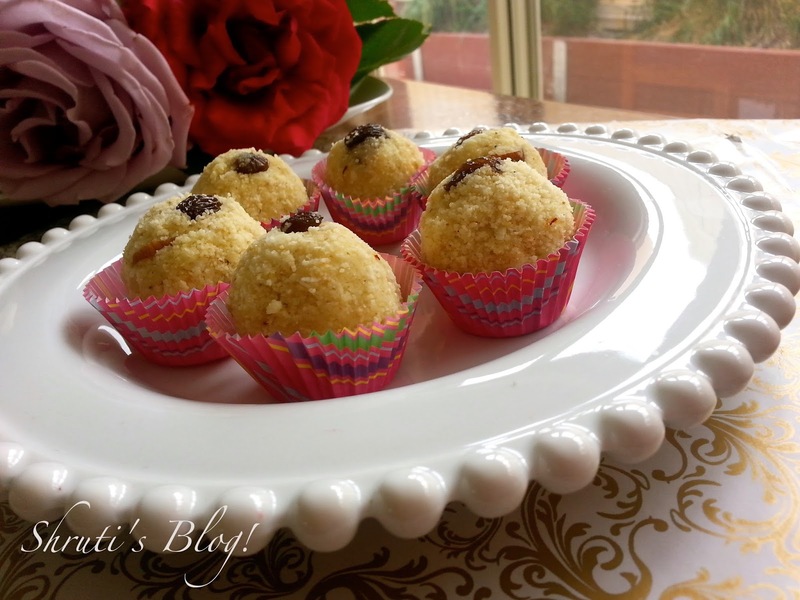 When the mixture resembles moist crumbs or moist sand, it’s time to roll the laadoos. Any sooner will make the laadoos soggy or lumpy. If you keep it too long, it will become too dry and brittle, like a phakki powder. 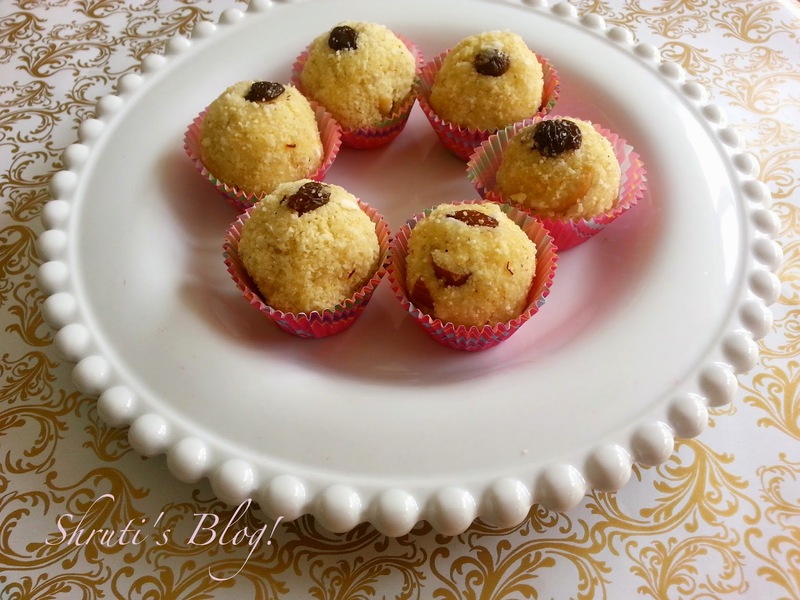 Roll the laadoos, tucking a raisin into each laddoo. Set aside to cool completely. Store in an airtight container. Store the laadoos in the fridge if you intend to keep them for more than a couple of days.